Though it's a weird camera to announce in conjunction with CES or PMA, given the amount of information now available about the Nikon D4, it's practically here. Nikon hits the important highlights with this replacement for the D3S: improved autofocus, increased durability, better performance, and more-competitive video capabilities. We've been anticipating this one for a while--Nikon Rumors pretty much nailed it down on December 19--but a copy of Réponses Photo surfaced with the story just ahead of Nikon's formal announcement. 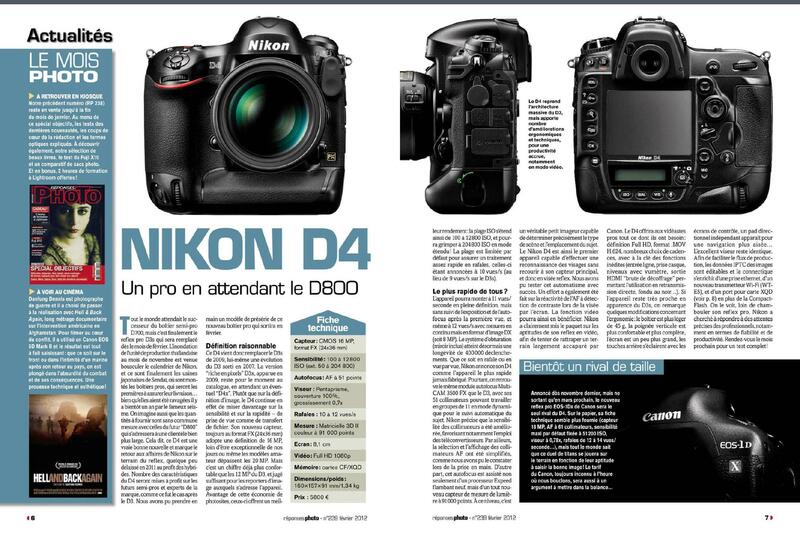 According to the magazine, the D4 will replace the D3S; unlike Canon, Nikon doesn't seem to be merging its vertical-gripped pro bodies into a single line. It should also be available before the 1D X, as well as cheaper, supposedly shipping in February for about $6,000. The lower price is unsurprising given the slightly slower burst and less magnified viewfinder, which are the features in a dSLR for which it's increasingly expensive to eke out 1 more frame or a fraction of a multiple. In fact, it reportedly will retain the (quite good) viewfinder from the D3S. Though it retains the same number of autofocus points, according to Réponses Photo, Nikon supposedly has simplified the process of using the various AF options, which had become a seriously confusing system, and the camera gaines a stop of AF sensitivity in low light, which is always welcome and brings it into parity with Canon. Nikon is reportedly also beefing up the video capabilities significantly. In addition to a full set of essential frame rates, it will use the Live View contrast-detection autofocus for AF in video capture, have headphone and mic jacks with audio level controls, and support uncompressed video output through the HDMI port. It uses H.264 B-frame compression, though that's not nearly as interesting as Canon's support of I-frames; bipredictive compression reduces file sizes, but intraframe-only compression delivers better quality. It supports 1.5x and 2.7x crop modes in movie capture, for extended zoom with a given lens, though it doesn't seem to have a direct 1,920x1,080 mode for pixel-for-pixel video capture. Nikon also claims the faster sensor (it's listed as 16-bit processing in the press release, but that could mean 16-channel readout) produces less rolling shutter. The sensor has 7.3-micron pixels compared to the 1D X's 6.95-micron, which may aid in producing better low-light video, where noise reduction can be trickier than for stills. It will offer face detection (not clear if there's face recognition as well) like the 1D X, probably made possible by the new higher-resolution metering sensor and Expeed 3 imaging engine, onto which Nikon tends to offload tasks like that. The 10fps continuous shooting spec is for full resolution, full autofocus. It will be able to do 11fps with AF fixed at the first frame and 12fps at 8 megapixels. Some other notable features include in-camera multishot HDR plus a 9-frame exposure bracketing with a range of +/- 5 stops and time-lapse capability. (I can't remember if that was in the D3S, but it's still welcome.) The body has the same rugged, weather-resistant build of its predecessors, and Nikon say's that the design has been streamlined for more fluid shooting operation as well. Like the 1D X, it now boasts an Ethernet port, and supports Nikon's WT-5A wireless transmitter. Overall, it sounds like a good, essential set of enhancements, and certainly enough to keep Nikon devotees from envying their Canon counterparts. I'd like mine now, please. Nikon also announced a Nikkor AF-S 85mm f1.8G lens; it's slated to ship in March 2012 for $499.95. This story was originally posted January 5, 2012, 10:33 a.m. PST, and updated later in the day.